Robust job growth among firms employing fewer than 50 people, office tenants who are requiring more collaborative workspaces and fewer private ones, and the ascension of secondary, 18-hour cities as magnets for capital are among the major trends influencing the commercial real estate industry, according to Emerging Trends in Real Estate® 2016, copublished by the Urban Land Institute and PwC US and released on Wednesday at the 2015 ULI Fall Meeting. 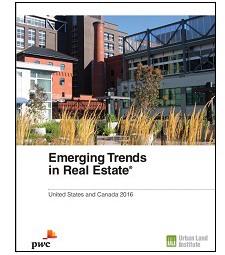 Now in its 37th year of publication, the Emerging Trends report reflects insights gained from interviews with and surveys of more than 1,800 leading real estate experts, including investors, fund managers, developers, principals of property companies, and other real estate professionals. According to the report, 46 percent of new job growth that has occurred since 2013 has taken place in firms employing fewer than 50 workers—a rate five times that of job growth within companies that employ more than 1,000 people. This trend is playing out in the kinds of office spaces that office clients are seeking from real estate developers as well as in a new and agile approach to parking that reflects an increasingly mobile and remote workforce, according to Andy Warren, PwC’s director of real estate research and co–principal author of the report with Anita Kramer, ULI senior vice president and director of ULI’s Center for Capital Markets and Real Estate. “The office is a barometer of change,” Warren said in his presentation of top trends and markets to watch. “We can consider it a petri dish for how things are going in the market [generally].” Not only is private space for individual workers shrinking and the demand for open, collaborative, and flex spaces growing, but the lack of new office construction in recent years and the need to retrofit existing office stock for today’s commercial tenants are presenting tremendous opportunities for the real estate sector. “The potential for office development is high,” said Warren, particularly since contract work is so prevalent in the so-called gig economy and since job growth in the technology, advertising, media, and information (TAMI) industries continues apace. Among the markets to watch identified by Emerging Trends, the newcomers to the top-ten list—including Atlanta, Dallas/Fort Worth, Charlotte, Nashville, and Portland, Oregon—reflect the desire by millennials and other demographic groups to gravitate toward 18-hour cities for their job opportunities, urban lifestyle and amenities, yet relative affordability and safety compared with New York City, Boston, San Francisco, and Washington, D.C.—24-hour global cities that all moved down the list for 2016. The panel discussion that followed Warren’s presentation cautioned against investing too heavily in these 18-hour markets, however. While the “trend is your friend” approach may yield outsized and short-term gains, a portfolio strategy that stands by the global gateway cities that have enduring value over many cycles may be smarter, said Ralph F. Rosenberg, member and head of KKR Real Estate. “The checks-and-balances in all this is asking whether we are overpaying for growth or baking in assumptions that rents are going to rise” in these 18-hour markets, he said, noting their relative lack of liquidity compared with that offered by global gateway cities. The panel also cautioned against having too rosy of an outlook and emphasized the need for investment diversification. While 84 percent of Emerging Trends respondents reported their business prospects in the coming year were good or excellent, a recession may not be that far off in the future, particularly since the 2016 cycle eerily resembles the pre–Great Recession conditions of 2006, said Mary K. Ludgin, director of global investment research at Heitman. “None of us knows what will be the trigger for the next recession,” she said, adding that it will likely not be as widespread or focused on housing as it was in 2007, but that it could affect certain markets and sectors acutely. Other noteworthy trends identified in the report include a reconsideration of suburbs as attractive and affordable places to live, particularly those that mimic the dense, transit-oriented and walkable downtowns of major cities. As they start to settle down and have children, millennials are increasingly opting for these affordable, yet urbanized locations. Food also is emerging as a major driver of real estate decision making since consumers are demanding innovative delivery systems and infrastructure that support urban agriculture and equitable access to healthy, fresh food. For a full listing of the top trends and markets to watch, read the full Emerging Trends report online. A new report from the Urban Land Institute, Bay Area in 2015, suggests that the San Francisco metropolitan region is at risk of losing millennials in the years ahead because high housing costs are making them increasingly skeptical about their ability to eventually move into homes in neighborhoods with the high livability attributes they desire. The report, released at ULI’s 2015 Fall Meeting in San Francisco, finds that 74 percent of millennials living in the Greater Bay Area are considering moving during the next five years, although housing affordability concerns suggest that they will be more apt to move away from the area than within it. Just 24 percent are very confident that they will be able to own or rent their desired home in five years—a dramatically lower percentage than members of generation X, 38 percent of whom voiced strong confidence in their ability to move up, and baby boomers, at 49 percent. Another possible indicator of housing affordability challenges for the Bay Area’s youngest adults: whereas 34 percent of millennials currently live in apartments—compared with 21 percent of gen Xers and 11 percent of baby boomers—an equal percentage of millennials expects to be living in apartments in the future, compared with just 11 percent of gen Xers and 8 percent of baby boomers. Bay Area in 2015 is based on a survey of 701 adults in the Greater San Francisco Bay Area conducted in February 2015 as a companion to a national survey conducted for ULI’s America in 2015 report, which was released last spring. The findings of Bay Area in 2015 should serve as a wakeup call for how San Francisco grows for the future, said Patrick L. Phillips, ULI global chief executive officer. “Millennials make up the largest, most diverse generation in our history, and they will have an enormous impact on the success of our cities. San Francisco needs to consider how declining housing affordability is affecting the high quality of life it is seeking to provide for all residents, including this powerful group,” he said. During a packed real estate session Wednesday, a group of housing experts discussed ways to address the shortage of affordable housing in the nation’s most costly markets. One solution: build denser, smaller, and smarter. Patrick Kennedy, owner of Panoramic Interests, described the company’s efforts to address affordable housing in the San Francisco metropolitan area by building micro-units, ranging in size from 275 square feet (26 sq m) for one person to 675 square feet (63 sq m) for four people. The units, which are furnished with convertible furniture and built with prefabricated materials, are proving to be very popular with millennials in the early stages of their careers who prefer going out to socialize over staying at home, he noted. Another solution: build mixed-income units, offsetting the cost of affordable units with high-end units. William A. Witte, chairman and chief executive officer of Related California, discussed the company’s development of Transbay Block 8, a condominium tower in San Francisco’s urban core with affordable, mixed-income, and luxury units. At this popular location, mixing lower-end with higher-end units “has had no impact” on the marketability of the luxury condos, he said. The use of luxury units to offset the affordable units, combined with incentives provided by the city, made the project possible, he said. “You can do this with creative financing,” he said. Still another solution: think about how to use the existing stock of single-family homes to house more people. Carol J. Galante, faculty director and distinguished professor at the Terner Center for Housing Innovation at the University of California, Berkeley, pointed to two factors that are exacerbating the shortage of affordable homes in San Francisco and other urban areas in California—rents outpacing incomes, and housing demand far outstripping supply. In addition, she noted that the number of single-family rental units continues to rise, suggesting opportunities for creative uses of this sector to accommodate more people. With the majority of the housing stock being single-family homes, “we need to think differently . . . and intensify the use of these homes,” she said. In candid remarks during Tuesday’s opening general session of the 2015 ULI Fall Meeting, Airbnb cofounder and CEO Brian Chesky described his company’s model of hospitality as complementary, rather than a threat, to the traditional hotel industry since Airbnb’s global network of hosts can alleviate consumer demand that cannot always be met during periods of peak occupancy. Chesky addressed meeting attendees as part of a conversation with Constance Moore, president and CEO of BRE Properties, ULI San Francisco board member, and the sponsorship committee chair for the 2015 Fall Meeting. Chesky shared the improbable story of Airbnb’s creation and of how he—the son of two social workers who simply wanted him to get a job with health insurance—became a technology entrepreneur worth billions. In order to make rent, he and his roommate, a fellow Rhode Island School of Design graduate who, like Chesky, was broke, decided to turn their apartment into a makeshift bed-and-breakfast to host attendees who were coming to San Francisco for a design conference. Because neither had a real bed, Chesky and his roommate rented out three air mattresses to their guests—hence, the name Airbnb. An idea that began as a lark in 2007 has come a long way: Airbnb was recently valued at $25.5 million by investors, and lists 1.7 million homes for rent across more than 190 countries on its website. Despite these growth metrics, Chesky emphasized that the personal connections that develop between hosts and guests and the experience of belonging that hosts offer guests—rather than rooms or inventory—are what his company is about. While nobody thought in Airbnb’s early days that tourists would be willing to stay with strangers in an unfamiliar city, the opposite has turned out to be true. Hosts love opening up their homes to travelers, and travelers have found places to stay that had a personalized touch and that felt more like home in an unfamiliar city. “This weird thing that happens is that the normal one-year arc of a friendship gets compressed into a few hours,” he said. Women in the real estate and land use industries have strong ambitions to lead companies and are willing to make multiple moves or start their own companies in order to advance their careers, according to a report developed by ULI’s Women’s Leadership Initiative (WLI) and released Tuesday at the ULI Fall Meeting. Women in Leadership in the Real Estate and Land Use Industry examines the current state of women in the industry as well as identifies the most important strategies firms can undertake to advance more women to positions of seniority and visibility. The report found that among the 1,234 ULI women members surveyed for the study (roughly 19 percent of ULI’s female membership), 62 percent aspire to hold C-level positions at some point in their career. Of those respondents who are CEOs, 93 percent lead companies with fewer than 100 employees; a large number of these companies are sole proprietorships. In addition to surveying ULI members, WLI researchers convened focus groups in four major U.S. cities to gather information from women at various stages of their real estate careers. The report also includes five case studies of companies that are doing exemplary work in advancing women to leadership roles and developing an inclusive workplace culture that values the contributions of women at all levels. The WLI report was the subject of a panel discussion on Tuesday featuring representatives of companies that, like those profiled in the case studies, have developed internal cultures that prize diversity of gender, ethnicity, and viewpoint. For some women, their companies have provided a level playing field where employees are measured by the merit of their work and ideas. This has been liberating and empowering in that it has allowed women to seize opportunities presented to them. “If women can be part of a meritocracy, that can be very powerful,” said MaryAnne Gilmartin, president and CEO of Forest City Ratner Companies in New York, one of the companies covered in a case study. The WLI report confirms Gilmartin’s view, with survey respondents saying informal processes, like offering women challenging work assignments, are more important to women’s career advancement than formal policies and programs. Kathleen Carey, ULI chief content officer and moderator of the panel, said she was strongly encouraged to step up to the plate in her own career: her supervisor at GE Capital told her to go for a “line job,” one where she managed a profit and loss statement and was held accountable for a GE business line. The discussion often returned to the importance of creating a workplace culture that values collaboration, entrepreneurship, and flexibility—particularly as men and women both shoulder more caregiving duties at home. But sometimes formal process work, too, to ensure that women are advanced to high-visibility positions. Panelist Andy Cohen, who shares the CEO position at Gensler with Diane Hoskins, said his company’s emphasis on collaborative leadership encourages cooperation among team members and the inclusion of many different perspectives in strategic decision making. Gensler has also created a series of training programs to facilitate cross-cultural collaboration and project management for its more than 5,000 employees across 46 cities around the world. Technology also will play a critical role in equalizing opportunity and in the retention of talent by creating more flexibility—helping employees meet the demands of both career and life outside work. Calling herself a member of the “sandwich generation” that is caring for both young children and aging parents, panelist Stephanie Haynie Wiggins, executive vice president and chief investment officer of the AFL-CIO Housing Investment Trust, said companies that prioritize work/life balance will be able to retain employees who want to perform highly both at work and at home. With the fierce competition for talent and a shrinking workforce, companies cannot afford to lose high-performing employees who feel they have reached a glass ceiling for their ambitious. “We don’t have the luxury of kicking the baby birds out of the nest,” Wiggins said. Many stories have been written about the shortage of water in the U.S. West, and about the many actions cities and states have taken to manage their local supply. A panel at the 2015 ULI Fall Meeting addressed why it is now imperative that real estate developers think about securing their own water supply and not rely on what used to be a municipal responsibility. Asked how developers can help solve regional supply problems, Thomas Iseman, deputy assistant secretary for water and science, U.S. Department of the Interior, said it is as simple as having the real estate community involved. According to Iseman, the conversation needs to move beyond the public sector and there needs to be more organizations like ULI that convene the private sector to help raise awareness about the need for new investments in water infrastructure. Thomas DiPrima, president, southern California urban operations, KB Home, said this is already beginning to happen since both building owners and landowners are getting penalized for not having infrastructure that is up to date. KB Home is taking a proactive approach to sustainability and resource management through new products: its Double ZeroHome achieves net zero energy use and net zero freshwater irrigation use through an innovative water recyling system and its ability to produce as much energy as it consumes. The Double ZeroHome is featured in Returns on Resilience: The Business Case, a ULI collection of case studies that demonstrates the value creation that results from investing in resilience and sustainability measures. Matthew J. Diserio, president and cofounder, Water Asset Management LLC, said the solution goes beyond prioritizing water infrastructure projects. He emphasized the need for developers and public officials to partner with the agriculture community—which currently consumes a majority of the water supply—so that there is more supply for their projects. While he stresses the need for partnerships and conversation, he said that they will not solve the overall problem. While some developers and municipalities have experimented with saltwater desalination plants, they need to continue finding ways to create new water resources. The high level of Asian investment in U.S. and European property markets is likely to continue and grow, panelists said during a Thursday session on Asian cross-border investment at the ULI Fall Meeting. “We are only at the beginning of the process of seeing Asian capital coming into the U.S. and European real estate markets,” said Ryan Botjer, senior managing director at Tishman Speyer. That sentiment was echoed by Kok Sun Lee, regional head, real estate Americas, at GIC Real Estate. “Asian capital investment into the U.S. real estate market is a permanent feature,” he said. The panel’s consensus that greater volumes of Asian capital are ready to enter the United States and European markets was set against the backdrop of already significant levels of investment. Megan Walters, head of research, Asia Pacific capital markets, at JLL, highlighted recent Real Capital Analytics (RCA) data that show the largest cross-border real estate investment from Asia in the past 18 months came from Singapore. Those investments included the purchase of $12.2 billion of assets in the United States and an additional $5.9 billion of assets in Europe. This was more than the $8.7 billion of Chinese investment in U.S. real estate and $7.4 billion investment in European markets. Botjer noted that the international investments being made by Chinese investors are only a fraction of their overall operations. Chinese investors typically look for diversification, he said, and have spent the past few years developing partnerships and systems that would enable them to scale up their investment in due course. Botjer also stated that Chinese institutional capital was attracted to the United States because of the ready-made pool of investments available; in comparison, the domestic Chinese market is mostly focused on development. Richard Price, chief executive, Asia Pacific, at CBRE Global Investors, agreed. “Chinese investors have genuine aspirations to build global portfolios and business,” he said. The United States is a prime target for this investment due to liquidity, transparency, and economic growth, he said. He argued that although some other established global markets in Europe and Asia do offer comparable conditions, none offers the same scale of investment opportunity as that in the United States. As more and more entrepreneurial professionals enter the workforce, the demand for a more flexible type of workspace will grow. At present, nearly 40 percent of workers who rent coworking space also have a permanent workspace with their employer. In addition to those professionals who do not like their current work environment, today’s entrepreneurs—unwilling to take the risk of signing a three-year office lease—increasingly are choosing to visit a coworking facility on their own schedule. One Fall Meeting panel described a growing market trend in which office space is increasingly becoming viewed as a service. Coworking is defined as unrelated professionals gathering to share workspace and benefit from communal amenities. The successful models that have emerged in this market are companies that are more service-oriented, going beyond simply providing space. Among those on the panel were representatives from TechShop, RocketSpace, and Workshop Café, successful companies that provide office space to entrepreneurs, venture capital–backed companies, and startups that do not want to lease commercial office space. Workshop Café, which was featured by Apple Watch, is a San Francisco–based startup that provides workspace for less than $3 an hour, but also offers food, coffee, wi-fi, and computer monitors. When asked about the future of the coworking market, panelists all agreed that more people will continue to move away from long-term leases and instead elect to use coworking space. As the demand for this type of space increases, real estate developers—in both retail and office—must figure out how these types of companies can fit into their overall developments and how they can capitalize on this explosive trend. Futurist Paul Saffo closed ULI’s Fall Meeting in San Francisco with insights on the exponential growth in technology, capping a week of discussions on how technology is affecting all aspects of urban design and development. His advice for land use professionals: when it comes to technology, don’t try to be the change. Rather, adapt to it. Build for permanence in a way that easily and efficiently accommodates the change caused by those who are creating it. Saffo’s comments set the stage for a discussion by Michael Covarrubias, chairman and chief executive officer of TMG Partners, and Daniel McQuade, chief executive of Tishman Construction Corporation; Patrick Phillips, ULI’s global chief executive officer, was the moderator. McQuade pointed out that while some aspects of the development industry—such as design and communications—have become much more efficient due to technology, the actual building process has not advanced much over the past 30 years. “I am hopeful we will see more change in this area,” he said. Driverless auto technology could lead to driverless equipment, he noted, creating much safer working conditions on construction sites, expediting construction, and lowering construction costs. Despite the challenges posed by the unknowns associated with technology advancements, this era of rapid change offers great opportunities for the real estate industry, panelists noted. “I love the new world of disruptive technology. Disrupters are going to get disrupted; it’s a continuing flow. And that means companies have a reason to grow. It’s good for the economy. The whole concept of technology as a feeder to an industry that wants to build—that is what I find most exciting,” Covarrubias said. “The dynamic systems in buildings now, the energy efficiency—buildings are better for the occupants, they work better, they are more sophisticated, and I think we are on that upside of that trend,” McQuade said. Looking for an online version of reports released at the 2015 Fall Meeting in San Francisco? They’re easy to download at our one-stop shop for new ULI research. Visit http://fall.uli.org/reports/, where you’ll find Emerging Trends in Real Estate 2016, Returns on Resilience: The Business Case, and Bay Area in 2015, among the many reports released at the Fall Meeting. Stay tuned for further coverage of the ULI 2015 Fall Meeting in Urban Land over the coming weeks. The daily winner for period four of the #ULIFall Photo Contest is BCT Architects. Their Instagram handle is @bctarchitects. BCT Architects is also our #ULIFall photo contest grand prize winner and will receive a complimentary registration to next year’s Fall Meeting in Dallas. 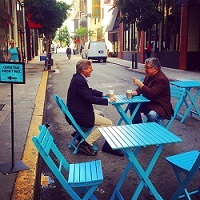 Attendees of the ULI 2015 Fall Meeting spent the week documenting their experiences in and around San Francisco and throughout the Fall Meeting as part of a ULI social media photo contest. Check out our gallery of their photos!